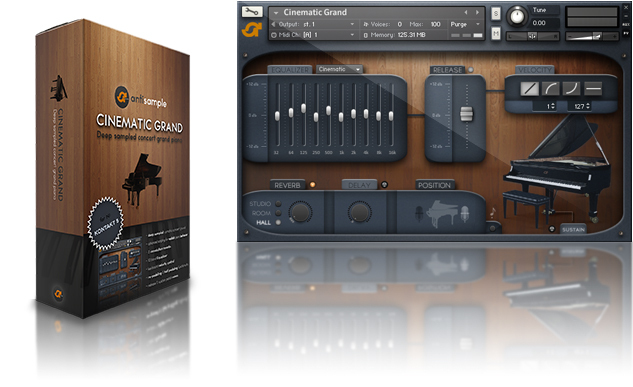 Cinematic Grand is a better quality piano library than many of its competitors in a similar price bracket and a useful addition to most studios. Read the full review here. Added Staccato Button which shortens the release time of the unsustained samples to tighten them up. Now works with full retail versions of Kontakt 4.2.3 and Kontakt 5.2.1 and up. You can freely adjust the sound of the dry recorded samples with our custom 10-band Equalizer, add one of three hand selected reverbs and delay or change the listening position from player to audience - all with the click of a button in our custom interface. You can also choose from four pre-defined velocity response presets to further suit your playing and recording style. All of the effect parameters are fully automatable to give you even more flexibility to shape the sound of the piano at the DAW level or in real time using hardware controllers. The combination of these intuitive interface controls, the meticulously recorded samples and intricate scripting for realistic pedaling and sustain modeling make the Cinematic Grand the perfect choice for productions ranging from classical, jazz and contemporary pop to ambience, soft rock and of course film scoring. The warm tone of this piano blends beautifully with accompanying instruments or cuts right through the mix. The Cinematic Grand shines as a solo instrument in spacious halls or intimate rooms. It puts you in control of the sound but remains as simple and intuitive as a real piano. We hope it will inspire you to write great music. *Hovering over the controls will display explanations at the bottom of the Kontakt Window. I give Cinematic Grand 4 out of 5 subs, it’s easy to use, doesn’t take up much space, and has a good sound quality. Read the full review here. How to use Cinematic Grand in Kontakt 4? If you purchased the Cinematic Grand before August 16, 2013 you'll need to send us an Email to support@antisample.com with your transaction number and we'll hook you up with the Kontakt 4 patches. If you purchased the instrument after August 16, 2013 your download will already contain the Kontakt 4 patches. Simply extract them into the instruments root folder and you're good to go! How do I revert to the default EQ settings? The latest update (v. 1.1) comes with a fully featured EQ preset menu which allows you to quickly and easily revert to the default settings, bypass the EQ entirely, choose from factory presets and even store your own. You can now also reset the individual EQ sliders to 0 db by ctrl-clicking (cmd-clicking on MAC) on them. Is the Cinematic Grand suitable for fast, staccato playing? The latest update includes a staccato option which tightens the release of the unsustained samples for super fast, percussive playing. You can find the staccato button next to the Position Control at the bottom of the Interface. Only unsustained notes are being affected by this control and all half or fully pedalled notes will ring out as usual. By downloading and/or using any of the products offered by antisample via www.antisample.com or elsewhere you agree to be bound by the terms and conditions specified below. Antisample products are provided by antisample “as they are” and “with all faults.” Antisample makes no representations or warranties of any kind concerning the quality, safety or suitability of any of the products, either expressed or implied, including without limitation any implied warranties of merchantability. Antisample makes no representations or warranties as to the truth, accuracy or completeness of any statements, information or materials concerning the products that are contained on and within any of the websites operated by antisample. In no event will antisample be liable for any indirect, punitive, special, incidental or consequential damages on your computer, both hard -and software, however they may arise. You may not sell, sublicense, loan, give, or transfer the products to a third-party, or allow them to be accessed by anyone. The payment to antisample is final and no refunds will be given in the event that you are dissatisfied with the products. No partial refunds will be given in the event of data loss after any of the products have been downloaded to your harddrive. All of our products are digitally watermarked using proprietary zero bit encryption (bitkey - registered trademark) that is embedded into each file and tied to a unique transaction number which enables us to identify the source of illegally distributed files. Users who attempt to circumvent this protection or otherwise violate any of the forgoing terms are subject to criminal and civil penalties and liable for monetary damages. Antisample will use all remedies of the law against anybody who violates the terms of this agreement. Prices, DRM protection, and availability are subject to change without prior notice. Antisample reserves the right to modify these terms at any time.